Heat oven to 375°F. Spray large cookie sheet with cooking or baking spray. In large bowl, stir cookie mix, butter and egg until dough forms. Stir in cereal. 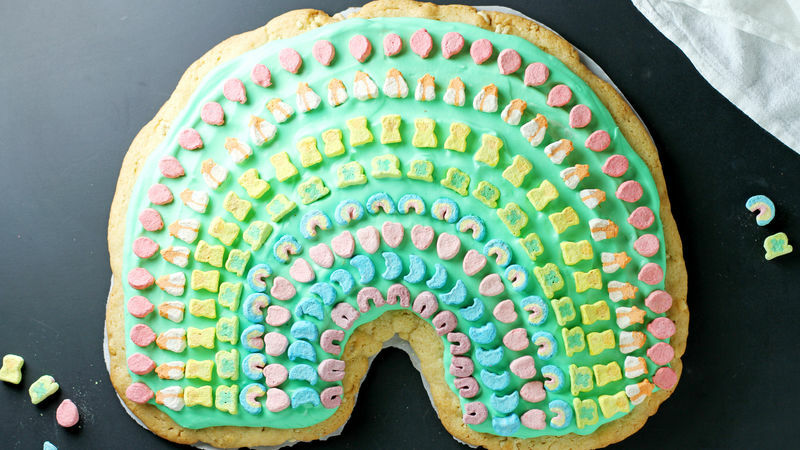 Press dough onto cookie sheet into a rainbow shape about 1/4-inch to 1/2-inch thick. Bake 12 to 15 minutes or until edges are golden and center of dough is set. Cool completely, about 30 minutes. In large bowl, beat whipping cream with electric mixer on high speed until soft peaks form. Carefully stir in frosting and food color. Use an offset spatula to spread frosting over cooled crust. Top with cereal marshmallows in color-coded rows. Store in refrigerator. If desired, use 2 cups frozen (thawed) whipped topping instead of the heavy whipping cream. It’s best to use a large box (20.5 oz) of Lucky Charms™ cereal to make sure you have enough marshmallows.